In today’s crowded investment environment, there are many passive and active strategies. However, there is a risk that passive strategies can become indistinguishable from one another while active strategies can be scale constrained, with an unjustifiable fee. There is also space in the market for an investment solution which contains both active and passive features. 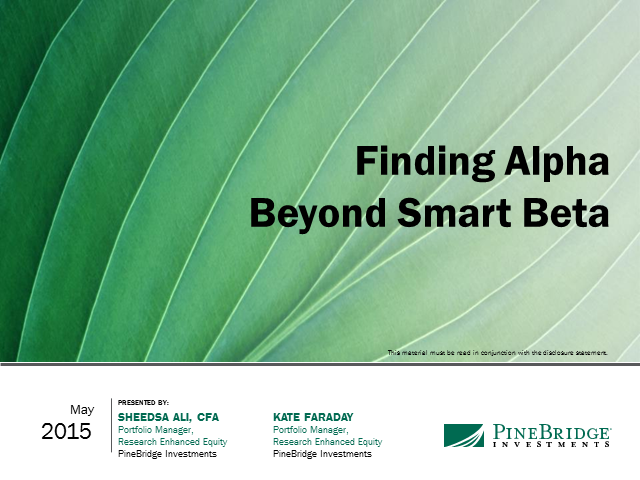 Join Sheedsa Ali and Kate Faraday, Portfolio Managers of the PineBridge US Research Enhanced Equity Strategy, to learn more about this “smart beta plus” approach and how it can help your portfolio.